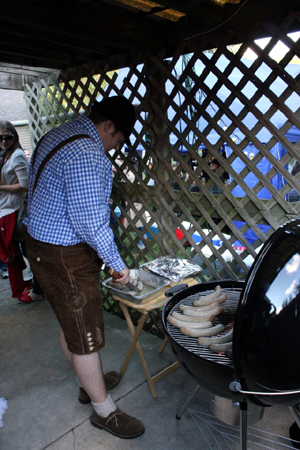 I never made an official post for last year’s First Annual Oktoberfest Party but it was the spark that started a yearlong quest to try and host the best backyard Oktoberfest possible. Last year’s party also inspired the creation of BackyardOktoberfest.com. 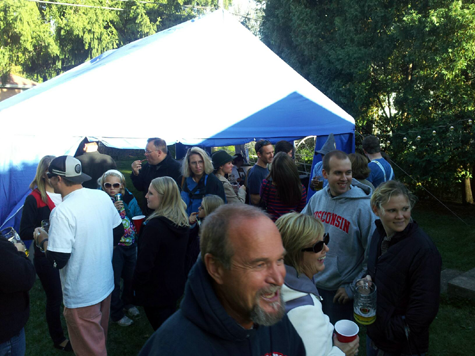 Once my backyard Oktoberfest ended last year I spent countless hours finding everything I could to host an even more amazing party than the year before. I believe I reached my goal but there will always be room for improvement. Backyard Oktoberfest’s Second Annual Party was held on Saturday, September 22, 2012 to coincide with the official opening of Oktoberfest in Munich. The morning started bright and early at 7:00am. My buddy Parth stayed at my place for the night so he would be able to help which was greatly appreciated. We set up tables and chairs in the tent the night before after the Plano Oktoberfest but were too tired to do much more. We went to get the kegs around 8:30a so we would be at Binny’s right when they opened. I think the employees got a kick out of me coming in to buy the booze in full lederhosen. Speaking of the kegs, I was tremendously overjoyed with Binny’s Beverage Depot. I was able to reserve a keg of Spaten Oktoberfest as well as Paulaner Oktoberfest Wiesn which is the same beer they serve in the tents in Munich and I thought I would not be able to get! I also ordered cases of German red and white wine. After picking up the beer we put the kegs in the tent and set up the stereo equipment for the tent as well as putting additional beer, pop and water in coolers. I offered beer from 4 of 6 Munich breweries, Spaten, Paulaner, Hacker-Pschorr and Hofbräu. Then it was off to get ice. 264 pounds of ice (12 twenty-two pound bags) was a little overkill but it ensured that everything was cold. By that time my other buddy Eric showed up and we stared to get food and other things ready, all while Beerfest was running in the background. 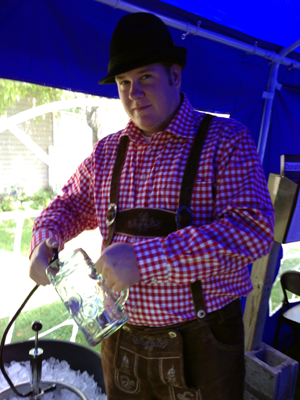 Then came time for the ceremonial keg tapping at noon, O’zapft is! We tapped the Spaten keg and the party “officially” started. Well, not really, it was only us three but we made sure to keep with tradition and tap the keg at noon. The party didn’t start until 3:00p. After the tapping, my parent’s showed up and the kitchen was in full swing. 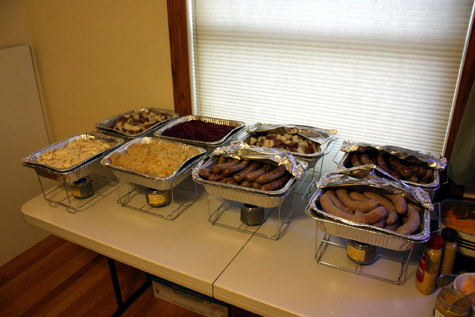 Pretzels were flying out of the oven; sausages were boiling as well as the potatoes; sauerkraut, German potato salad and red cabbage were also warming in the oven. Things were very busy. I also spent time fighting with iTunes trying to get my old phone to add my 2012 Oktoberfest playlist. Finally, 3:00p rolled around and the party really began. Luckily the weather held up and we were greeted with beautiful blue skies and warm sunshine which was needed because the high for the day was only supposed to be in the 60’s. Guests started arriving and rolling into the tent. 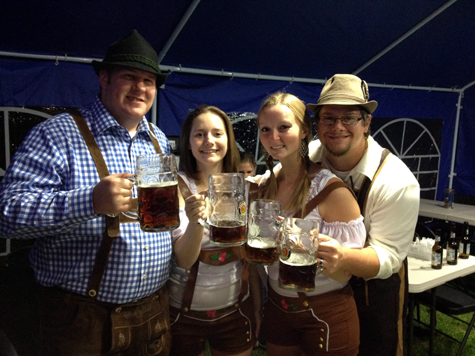 Everyone who wanted was able to drink their beer from a Paulaner Maβ. Thankfully, I was able to find the Paulaner Wiesn to Go at another Binny’s and increased my collection to 90 Maβ. My playlist stared out with more traditional music and polkas then continued on to the rock, dance, techno, pop that is known in the tents. I still try and play only music that is played in Munich with a few other songs added in to keep the guests happy. This year’s hit seemed to be “Gangnam Style” and to see everyone trying to do the dance was hilarious. It will probably stay on the playlist for next year to bring back memories. One big thing I would change for next year would be to have more food prepared in advance. I spent the first four hours of the party in the kitchen cooking or getting things ready for dinner. The majority of the food was prepared the day of the event. I did have a lot of help but I would have liked to spend more time socializing before my friends got too drunk. Another problem I ran into was the kegs going really quick. We killed two kegs in 4 hours. Luckily I had another two kegs worth of beer in bottles but I was really expecting the kegs to last longer. It is just something to keep in mind for next year. I also have to remember that European barrels are 50 liters which is roughly 8 liters less than your standard American half barrel. I will also make sure that orders I have coming from Germany are placed at least two months in advance. I am still waiting on a package from the Paulaner fan shop that I ordered in mid-August which has serving trays, coasters and two giant flags that I really wanted to use for the party. Overall I think the party was rather successful. There were probably around 80 – 90 people that showed up throughout the day. 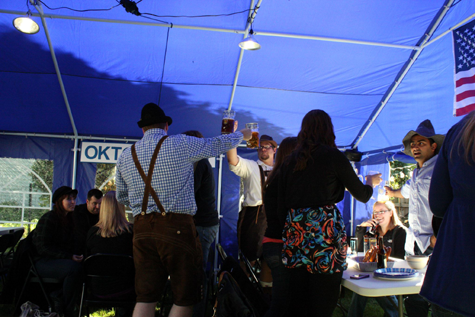 A number of people were in the Oktoberfest spirit and really enjoyed Ein Prosit every time it was played. The Oktoberfest spirit did die down as the night progressed. A bunch of people were too cold to be out in the tent and opted to go to my basement to play beer pong and listen to country music. 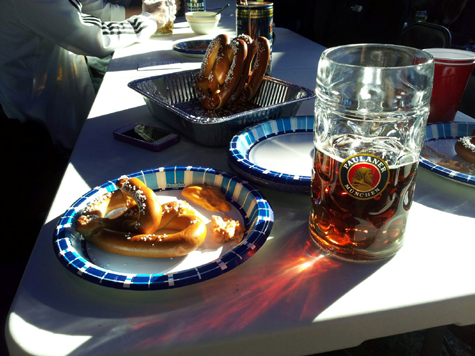 I enjoyed my tent, the Oktoberfest music and the beer. As much as I love my friends, I can’t wait to have an Oktoberfest party where everyone is really into Oktoberfest; the music, food, beer, and atmosphere but maybe that’s just wishful thinking. I really can’t wait to go back to Munich, hopefully in 2013. As always, I will be my own worst critic but overall I had a great time at my own party but there is always room for improvement and I can’t wait to see how next year’s party turns out. This is only the second year for my party and a number of people didn’t know what to expect. 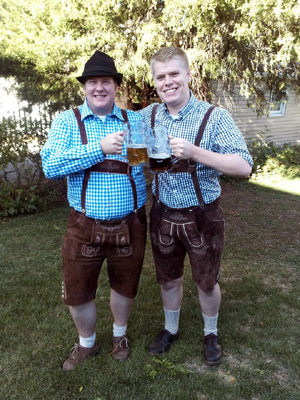 I think most expected a simple fall party and not a full out Oktoberfest. I hope they come back next year with even more enthusiasm for the beauty that is Oktoberfest and I hope to keep wowing them with a better Oktoberfest experience year after year.